A defendant was acquitted by the Minor Criminal Court of possessing and abusing narcotics, despite his blood and urine tests showed traces of drugs. 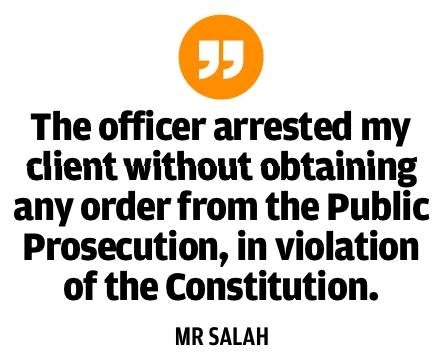 This was revealed yesterday by the defendant’s lawyer Omair Salah, who pleaded for the release of his client, claiming that the nature of his arrest was against the Kingdom’s Constitution. The details of the case show that the suspects were stopped by a police patrol vehicle and were asked for their identities. The officer said both men were in an “abnormal” state, and that they were high on a carburetor cleaner spray is commonly known as “Stop”. Both men were arrested and the results of their blood and urine tests came out positive for abusing drugs. On July 6 last year, the Public Prosecution accused the defendant of possessing and abusing narcotics (Clonazepam and Diazepam), as shown in his blood and urine samples. However, Mr. Salah questioned the arrest procedures, stating that they’re breaching the Kingdom’s constitution. The lawyer told the judges that the officer arrested his client without obtaining an order from the Public Prosecution, in violation of Article 19/b of the Constitution, which stipulates that “a person cannot be arrested, detained, imprisoned or searched, or his place of residence specified or his freedom of residence or movement restricted, except under the provision of the law and under judicial supervision”.